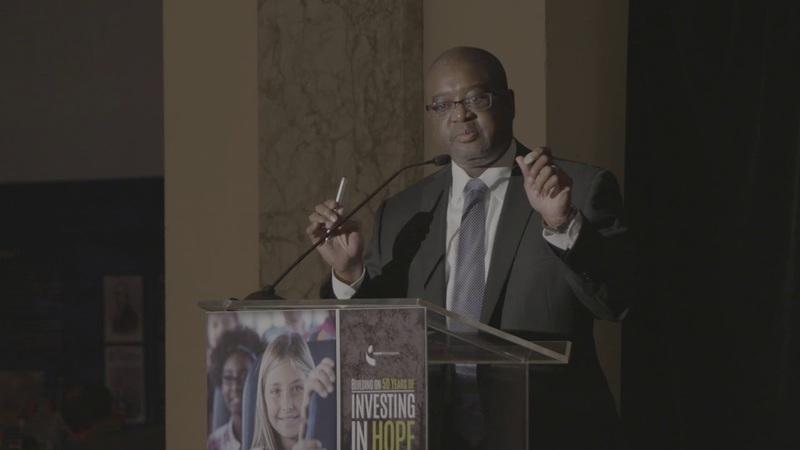 Casey Family Programs President and CEO Dr. William C. Bell addressed guests at the Investing in Hope dinner in New York City on October 19, 2016. 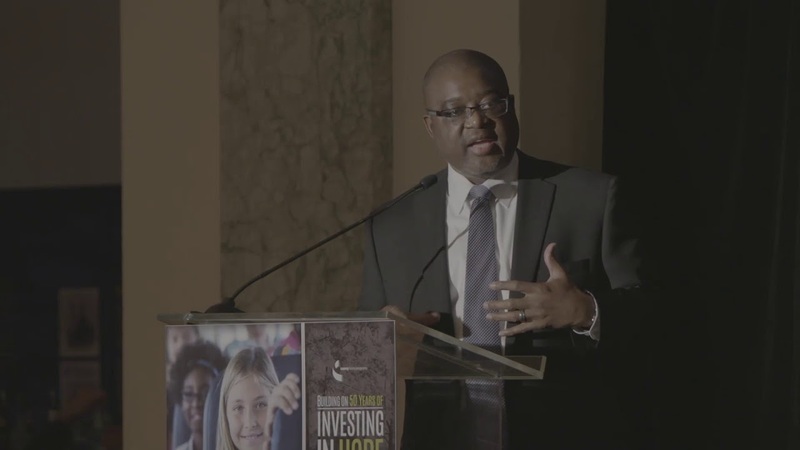 The event, held at the Museum of American Finance, informed business leaders about child welfare issues and encouraged them to invest not just money, but time, in America’s youth. Good evening. I’m William Bell, the President and CEO of Casey Family Programs. Cassandra, thank you for those remarks and for sharing your life with us. On average every 24 hours in the United States of America, we lose four children – most of them before they reach their sixth birthday – to child abuse and neglect. On average every 24 hours in this nation. Tonight as I stand here before you to introduce you to the commissioner for child welfare for the Administration for Children’s Services in New York, I would first ask you to pause with me for a moment for a little boy, six years old, Zymere Perkins. Zymere lost his life to child abuse. Can we just pause for a moment for Zymere? Thank you. Dr. King was known for quoting scripture when he would say, “And let justice roll down like waters, and righteousness like a mighty stream.” As he spoke those words, he was talking about getting to a place where we can each see everyone else the way we see ourselves as a human being who is living with the human condition, and all that comes with being human. Sometimes we get introduced to some wonderful human beings as their names are plastered across the media. You never know them until a child dies and then you hear how incompetent they are. You hear how their workers are incompetent. You hear how they failed this child. But until justice rolls down like waters and righteousness like a mighty stream, we won’t be able to see the people who – men and women – who run the child welfare systems across this country as the first responders that they are. When we hear a fire truck, we think that’s the first responder. They are rushing into a fire to save someone who may be trapped. When we hear a police siren, we think that’s a first responder. They are putting their lives on the line to stop crime, to stop the bad guys. But when our only introduction to the leaders of child welfare agencies and the staff in those child welfare agencies is the article that we read in the newspaper that says that the leader is beleaguered, the agency is beleaguered, the workers are going to be brought up on charges. But yet on average every 24 hours in America, three women die as a result of domestic violence. Most of those women – there was a piece of paper in a judge’s hands with a judge’s signature on it saying we know who would kill you if you get killed. There was a piece of paper in a police precinct with that lady’s name on it and the person who was going to kill her, his name is on it, saying we know who will have killed you if you get killed. But when they die, there are no newspaper articles that says the police department is beleaguered. There are no critics who cry out to say you need to unseat those judges. But yet these first responders – sometimes the only way you get introduced to the commissioner is through that newspaper article. Tonight, I want to introduce you to an outstanding public servant. I want to introduce you to a little Puerto Rican girl from the Bronx, a little Puerto Rican girl who grew up in the Bronx, who graduated from Fordham University. I want to introduce you to a little Puerto Rican girl who grew up in the Bronx, who graduated from the NYU School of Law. A little Puerto Rican girl who was called to go into public service when she worked at Bronx Legal Services. A little Puerto Rican girl who was raised in the Bronx, who was called by Ed Koch to serve on the board of CUNY. A little Puerto Rican girl who was called by Mayor David Dinkins to run the Community Development Agency. A public servant who has dedicated her life to children, to communities, to families. A little Puerto Rican girl who was asked to run two not-for-profits, Family Dynamics and Inwood House. A little Puerto Rican girl from the Bronx who worked for the Ford Foundation, who was called by Governor Spitzer to run the Office of Children and Family Services for the state of New York. A little Puerto Rican girl who I’m proud to call my friend because I’ve sat where she sits. I’ve sat at a place when people who don’t know me judge me. I hugged her tonight because I know her heart breaks just as much as anybody else’s heart each time that we lose a child. A little Puerto Rican girl who was then called to come and do two of the toughest jobs in America. Either one of them done separately can end your career. One is run the Department of Juvenile Justice. The other is run the Department of Children’s Services, and she has the task to run them both. I introduce her to you that way tonight because I need you to invest a little hope in her tonight. I need you to stand and welcome Commissioner Gladys Carrion to the stage because she is hurting right now in a way that you can’t imagine unless you have walked in those shoes. This is a public servant who has dedicated her life to investing in hope because she also understands that until justice rolls down like waters and righteousness like a mighty stream, we will never have the kind of system that helps us to end the deaths of those four children every 24 hours. We will never have the kind of system that lifts up every first responder whether they carry a badge, or a gun, or drive a big red truck, or not. They are nonetheless standing in between us and justice for kids across this country. And so I welcome Gladys tonight to present a proclamation to Casey Family Programs on behalf of the 109th Mayor of the City of New York, Mayor Bill DeBlasio. But I would ask you to just stand with me and invest a little bit of hope into the life of Commissioner Gladys Carrion. I think you’ve heard enough words tonight so this will be very few. You were introduced to the Board of Trustees. I’d like to take a moment to introduce you to the leadership at Casey. Obviously Joseph Boateng, our chief investment officer. Laura Sagen, our executive vice president for Human Resources and Organizational Development. Marva Hammons, our executive vice president for Child and Family Services. And Roxanna Nowparast, our chief program counsel and executive vice president for Legal Services. I don’t think that our chief financial officer is here, Dave Danielson. He traveled from Seattle to here only to get the flu somewhere along the way so we advised him to stay away. And Dr. David Sanders, who is our executive vice president for Systems Improvement who manages our technical support teams that go across the country to D.C. and Puerto Rico, working with all 50 states to help try and improve what’s happening with children. And so I will just close with two things. In front of each one of you, there’s a stone of hope and a pen, and I know many of you have become kind of professional at getting a piece of lamb, a piece of chicken, a piece of fish, and writing a check. Well, tonight we’re not asking you to write a check but we did give you a pen, and the reason we gave you a pen is because I would ask each one of you, as Dana mentioned when she said, is that a real promise or is that just a nice thing to say. What I’m asking each of you to make a promise to yourself tonight. Take the pen and write a promise to yourself about how you are going to invest in hope in a child’s life beginning right now, and make it a real promise. And if you don’t have an idea of what you can do, write down this email address, info@casey.org, i-n-f-o- at c-a-s-e-y dot o-r-g. I know we got a lot of MBAs in here, and I know you know how to spell that. But I want you to make a real promise and many of you are from New York. If you still don’t have an idea, contact Gladys at the Administration for Children’s Services and just say, “How can I invest in hope for the children that you serve?” I’m sure she has a list. If you want the list that Dana read off when she was here, contact us at Casey. We will make sure you can get that list. But I’m just asking you – don’t write a check, because I know you can do that. Invest in a child’s life and give them a reason to hope for a better future. Dr. King said, out of a mountain of despair, we can hew a stone of hope. I ask you to take this stone so that you will never forget that the only thing standing between you and investing in hope in a child’s life is you. There are no excuses. It’s just about making a decision. I ask you, let’s keep investing in hope until justice rolls down like waters and righteousness like a mighty stream. Thank you for joining us tonight, and God bless you all. The only thing standing between you and investing in hope in a child’s life is you.